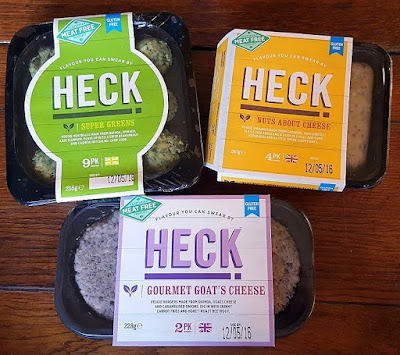 Heck are well known mainly for their incredibly special meat sausages, so it was a real surprise to me to discover they have launched a vegetarian range. 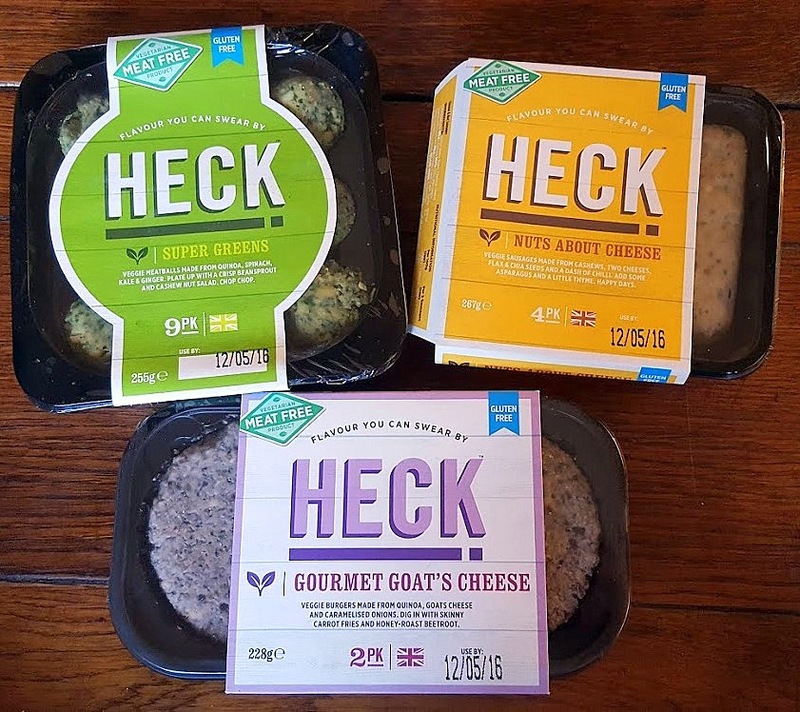 Knowing how much care and effort Heck take over their meat products, and their reputation for real food with excellent quality ingredients, it was something I was very excited to try, as were my family - veggie and non-veggie. Super Greens - Veggie meatballs made from made from quinoa, spinach, kale and ginger. 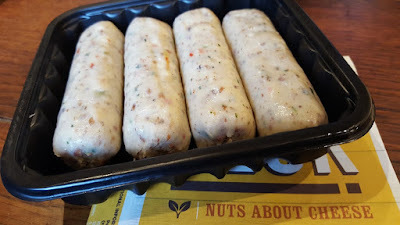 Nuts About Cheese - Veggie sausages made from cashews, two cheeses, flax and chia seeds, and a dash of chilli. 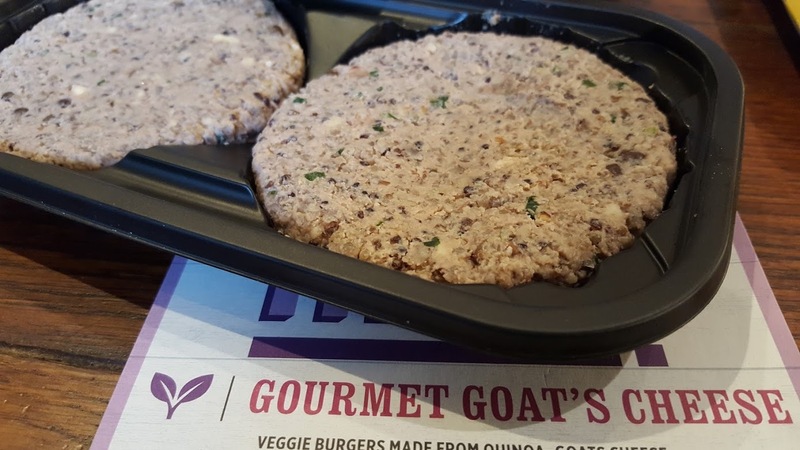 Gourmet Goat's Cheese - Veggie burgers made from quinoa, goat's cheese and caramelised onions. Regular readers may remember I don't really enjoy cooked cheese, so for reasons of fairness the rest of my family insisted they also sampled the products. Heck Super Greens are the only one of the 3 products that are vegan. 9 balls in a pack with an rrp of £3. They have a quite solid consistency and are quite dense, and drier when raw than I anticipated. 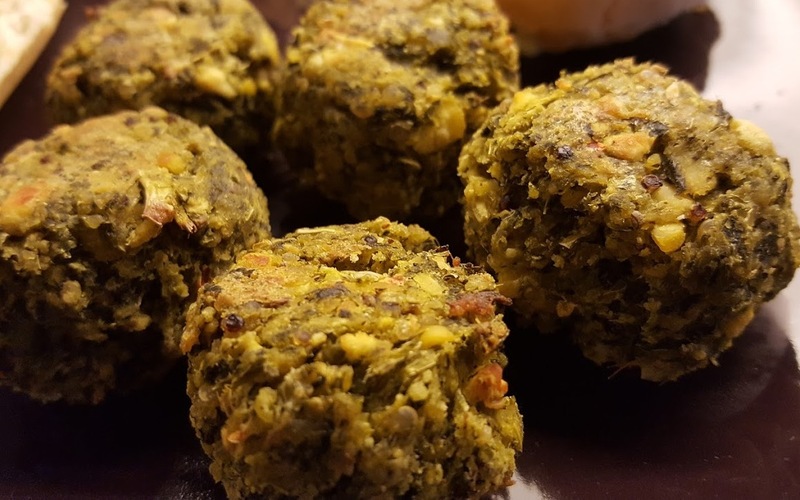 Very similar in texture, shape and size to Falafel, they are mainly chick pea and quinoa, but the taste is very different indeed. These are more herby, not spicy at all, but very strong tasting. It was also evident straightaway that they are a little heavy on the Coriander (always a risky move). Considering the density they cook very nicely, with a crispy shell and are soft, but not mushy inside. We nibbled on them the first time to test them, but I think because they are so strongly flavoured, you don't need any more than 1 or 2, and a couple of my family really don't care for Coriander, so they struggled with them. 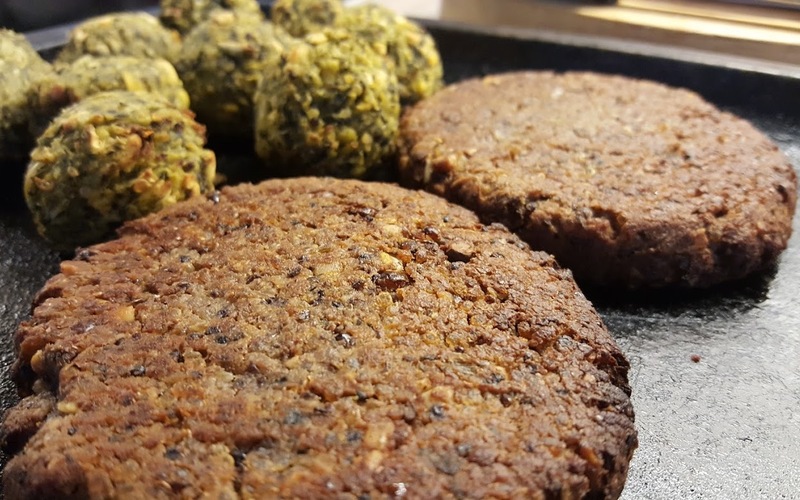 I've since used the Super Greens Balls in a burger bun and in a wrap with salad, which works much better and makes a nice alternative to a sandwich or burger. Good, but don't overdo them by attempting too many at once or you'll spoil it, and if you aren't a fan of Coriander then approach with caution. Heck Nuts About Cheese Sausages are a nut and cheese sausage that otherwise has more subtle flavours. Sold in packs of 4 with an rrp of £3. These are the most 'realistic' looking vegetarian sausages I've ever used, and have a thin skin which means frying them results in a lovely glossy golden sausage. The ends do escape a little during cooking as the cheese melts and the sausage contents heat and expand, but there is no excess fat to escape and they keep their shape nicely. They're great for adding to recipes because they do keep shape better than a lot of other 'real food' veggie sausages, even when chopped. The Nuts About Cheese Sausages were deemed 'very cheesy', so I avoided. 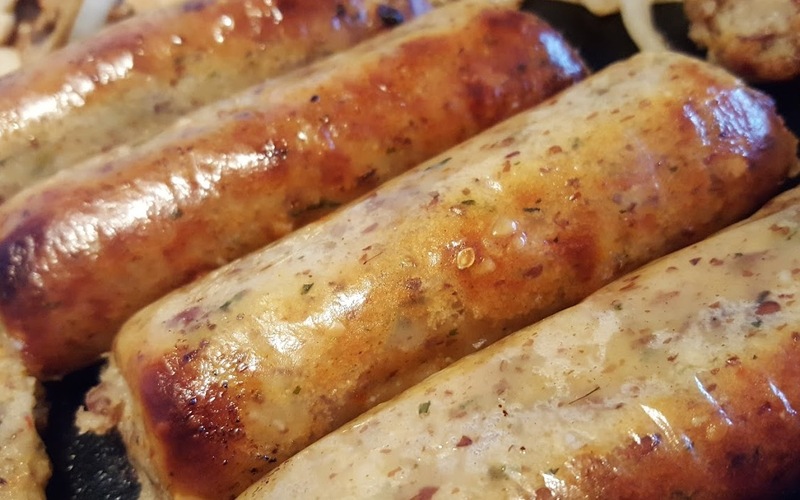 The general consensus is that the cheese taste is rich and delicious, and these sausages were very different to any usual sausage whether vegetarian or not, but different in a good way. When I cooked them again I had no trouble emptying the plate, although my little boys didn't like them for being 'too weird'. Definitely worth a try, especially if you like cheese. Heck Gourmet Goat's Cheese Burgers were the stunner of the show. Two burgers per pack with an rrp of £3. Not as cheesy as you'd think, I even had half and was very impressed. Mainly quinoa, but with a large proportion of nuts, they have a fresh, nutty taste above any other flavour. They may fall apart a little during cooking, but give you a crispy, delicious burger with a lovely texture. Fabulous in a bun, but maybe a bit risky on a barbeque, cook them in a pan or on a tray. I cannot imagine any vegetarian being disappointed by these. These burgers are now my partner's favourite burger ever. He adores them. He isn't vegetarian, but says he'd rather have these than any other burger he's ever tasted. I honestly could have served them up 3 times over and they'd have been eaten. DEFINITELY worth trying. In all it's a very impressive range of products that doesn't disappoint. 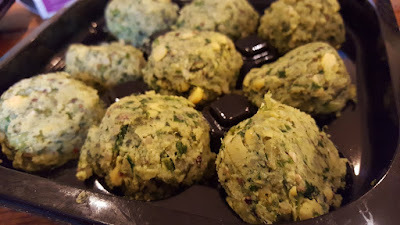 You can taste the quality, the ingredients all have a clear role and add to the overall effect, in the case of the balls maybe overdoing the Coriander, but in the burgers hitting perfect spot on. Full of flavour and each unique in it's market, they are a tastier and more decadent product than your everyday burger, banger or ball. The entire Heck Meat-Free range is Vegetarian Society Approved and gluten-free, and available online from Heck or from selected branches of Waitrose. We were sent our Heck Vegetarian Products for review. This range of food looks fabulous and I must try them one day. Always on the look out for some good veggie options and these are definitely on my list to try next!